It is a Bosch powerpack 500 and the other day it stopped charging. The charger seems to have some output since one of the LEDs on the battery lights up. It is only one LED though and I believe I remember the other LEDs (in the column of LEDs) light up in a fashion when charging. I only measure 5V of output from the charger which might, or might not mean something. The charger can be so cunning as to output only a low voltage until it has found out a proper Bosch battery is attached and is ready to be charged. I have tried taking the battery out of the charger and depress the button for 10 seconds as I have been told it resets the battery but to no avail. I have unplugged the charger, waited for some time, and replugged. Nothing is running hot, not battery nor charger. I am taking both battery and charger back to the shop but before that, is there another trick or check? The dealer has software with a license dongle s/he had to buy from Bosch. S/he connected a computer and saw some logs about the battery being too hot (I am certain it has not been) or cold (inprobable) and it being bricked due to hardware failure. S/he saved the log and then resetted the battery. I can now use the battery again. Bosch has commented the error log with "no danger". So Bosch bricked my (very expensive) battery without any reason and then forced me (the dealer) to pay for a solution. That is not serious business. Here are the indicator lights and reset procedure straight from my Bosch e-bike training manual. Voltage from the charger should be 5V so that doesn't seem to be the problem (See if it matches up with what is printed on the charger (either you have the 4 amp or 2 amp charger)). The battery does have a built in management system (BMS) that safeguards against overheating, overcharging, short circuiting. 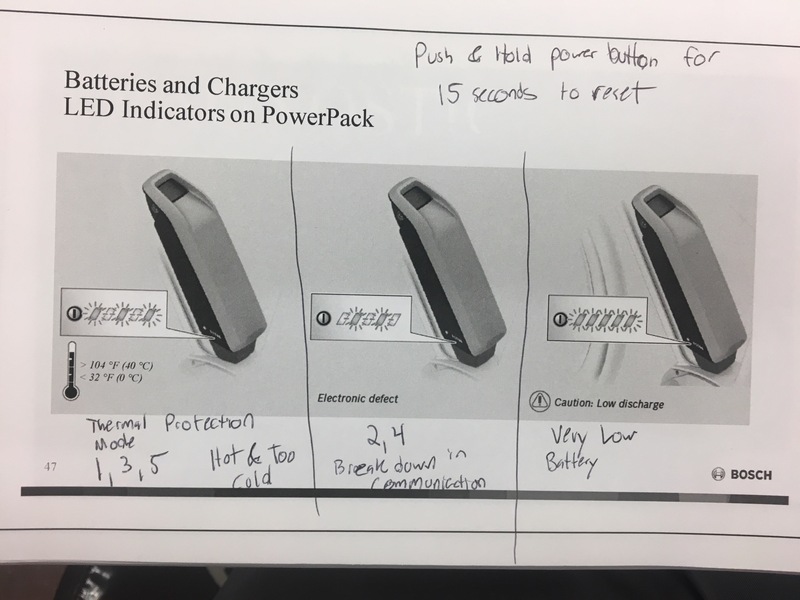 As per the picture, you need to hold the button for 15 seconds to reset the battery, not the 10 seconds you wrote about. When the battery is critically low and gets recharged, you will need to do that reset. I would recommend going into a Bosch certified shop if that doesn't work as they will have the dongle and access to the diagnostic software. modern smart chargers do start with a low voltage that enables a handshake then ramp up to full voltage and/or current. This is a safety measure because at full voltage (which could be 50vdc or higher), there are a shock hazard in their own right. Chargers do go bad, especially if they've been accidentally short-circuited or dropped. Try to find a friend or a store with a Bosch bike and see if you can charge your battery with that charger. It's the cheapest thing to go wrong, easiest thing to treat, and so should be attempted first. modern battery management systems monitor internal cell voltages so that battery pack doesn't become unbalanced and catch on fire. Some smart batteries will brick the entire battery if one or more cells go below a critical voltage level. They’ll then refuse to allow a charge. Some have a reset method but many will just lock you out. Some can get hacked by individually charging each cell back up to > 3.5 volts (see youtube videos on this) but others have a fused safety circuit that they blow that will totally brick the battery. If you're not comfortable taking apart a battery unit that has enough power to burn down your house and manually probing cells, you often have no recourse other than to get a new battery. Summary: check the charger first. If it’s the battery then swap it out if you’re under warranty. Not the answer you're looking for? Browse other questions tagged electric-bike battery or ask your own question. Kalkhoff Agattu (e-bike) Panasonic 24v engine dead - worth repairing?